Increasing importance of call centers for intensifying businesses has been fueling contact center software market share over the last few years. With the help of software, business development teams have been able to handle incoming calls, make outgoing calls, ensure workforce management, track key call center metrics, and load automated scripts effectively. The usage of software-based technologies for maintaining inbound and outbound customer communications across various business channels have been encouraging most of the industries to deploy call center software at their workplace. 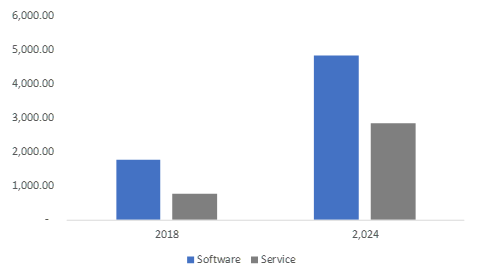 The advent of next-generation technologies such as IoT (Internet of Things), cloud computing, and AI (artificial intelligence) has also proliferated the contact center software market share. Speaking along the same line, currently, many of the contact center software developer companies have been investing to integrate more advanced features in their products for providing superior services. For instance, recently, Genesys has developed a new cloud-based workforce management software featured with AI. The use of AI technology in the existing software systems will significantly enhance the workforce accuracy. The company claimed that automated scheduling associated with AI will help the contact center to handle complex tasks and meet business goals easily. The decreasing deployment of outdated methodologies and technologies for dealing with advantageous business opportunities will further fuel contact center software industry outlook. In addition to AI, cloud computing is also one of the remarkable technologies that has made its presence felt in this era of modernization. In order to provide higher-level services with minimal management efforts, several companies have been relying on cloud computing-based contact center software. The security, reliability, scalability, and affordability of the cloud deployment model have essentially been responsible for the rising usage of cloud computing systems at contact centers. Considering the increasing popularity of cloud computing contact center software, most of the businesses are looking forward to acquiring leading service providers of the cloud contact centers. Such strategies have been helping them target more customer communication channels and have also been propelling the cloud-based contact center software market. Validating the aforementioned fact, a few days before, UCaaS start-up company, RingCentral acquired cloud customer engagement platform, Dimelo which manages digital customer communication channels comprising social media, SMS, email, and chat apps. With this acquisition, RingCentral has connected its sales lines directly to Dimelos’s customers namely Telenor, AXA, Allianz, BNP, ENGIE, and Orange. The increasing importance for cloud call centers for managing customer channels over the Internet is likely to enhance cloud contact center software market size over the years ahead. While strengthening the business, it is mandatory to monitor the activities of employees to ensure a productive work output. In addition, it is has become essential to provide advanced tools and service models that can boost the employees’ performance and deliver higher customer satisfaction. In order to unify and empower business development teams, IT, retail, BFSI, and healthcare firms have been investing in infrastructural development activities. The increasing awareness among the companies about the effective use of highly advanced contact centers has been generating lucrative opportunities for the players in the contact center software industry. As of now, numerous banks and retail companies have been deploying advanced technologies to provide better service to customers. The installation of software-assisted customer management systems has been helping them trigger customer response that would help improve the competitive business dynamics. Reportedly, owing to the shifting trends toward the surging use of digitalized and internet banking facilities, in 2017, BFSI sector accounted for approximately 30% share of the contact center software industry. Over the coming years, evolving technology trends will transform the future of contact center software market. Prominent companies like Google have been working with the players in the contact center software industry comprising Genesys and Cisco to build next-generation contact centers aided with virtual agents. The precise use of technology for improving enterprise value is thus poised to push the industry size. For the record, by the end of 2024, overall contact center software market will surpass a revenue collection of USD 40 billion.